Empowerment and Justice Action: An Open Letter “Reject The Death Penalty Execution for Convicted Victims Narcotics"
An Open Letter “Reject The Death Penalty Execution for Convicted Victims Narcotics"
First, the death penalty and executions had failed to lower the crime rate and the drug also failed to reduce the rate number of addicts or drug users in Indonesia. Since the Narcotics Act No. 22 of 1997 applied up to now apply the Narcotics Act No. 35 of 2009, the death sentence meted out to the perpetrators continued illicit drugs trafficking crime. But in fact, the number of illicit drugs trafficking crimes and the number of drug addicts just dont show signs of decline. Therefore, an alternative punishment should be considered to address the illicit drugs trafficking in narcotic drugs and instead continue to rely on the judgment that are not effective. Second, as people who understand the intricacies of illicit drugs trafficking crime, we see that in practice the majority of those who are caught by law and then eventually sentenced to death are people who are frail, psychologically vulnerable to exploitation, and pressed for financial crush, which coerced or forced into drug courier and not a real drug kingpin. The label "narcotic city" can not be generalized to all death row inmates narcotic especially to those who are women, because the position of women in drug crime are extremely fragile. Women in the narcotics business can not be separated from the business of human trafficking and violence against women due to gender inequality. Women become ensnared in drug crimes often being deceived, manipulated and given empty promises. When women were arrested for narcotics, law enforcement blindly accusing them of engaging in illicit trafficking chain and overlook the fact that they are victims of human trafficking or victims of violence from their partner. One of the women on death row will be executed, Rani Andriani, are examples of women who are caught in a drug crime because deceived by the drug mafia and economically depressed and psychology. Third, the death penalty and executions against illicit drugs trafficking offenders actually detrimental to the community addicts / users of narcotics. When narcotics executed death row, the big drug dealers will continue to seek, find and exploit other vulnerable individuals who are forced to become a drug courier. Community addicts / users can be targeted drug dealers looking for couriers such as the addict / drug users are people who already know the field and seen other people who could be targeted buyers. The addict / drug users, with all socio-economic vulnerability could actually become increasingly fall into illicit trafficking. This policy is contrary to Nawa Cita; The commitment of Mr. President Joko Widodo who want to embrace the addicts / users of narcotics. Fourth, we see that the execution of death row inmate drug is a form of hand washing countries that have failed to keep the Indonesian jurisdiction of the influx of illicit drugs trafficking. Indonesia government should make every effort to keep the Indonesian border area in order not to be penetrated by narcotics. But what happens is precisely state delegate the burden of guilt to death row narcotics. 2. For those who know and feel really bad effects of illicit drugs trafficking, we also want the illicit drugs trafficking can be stopped and not get killed again. We were tired with the rampant illicit drugs trafficking. The position we reject the death penalty and the execution of death row inmate drug does not mean we support the city of narcotics. We fully support the efforts of severe punishment to the actual drug lord, but death sentences and executions are not the right answers to the problems that arise. 3. 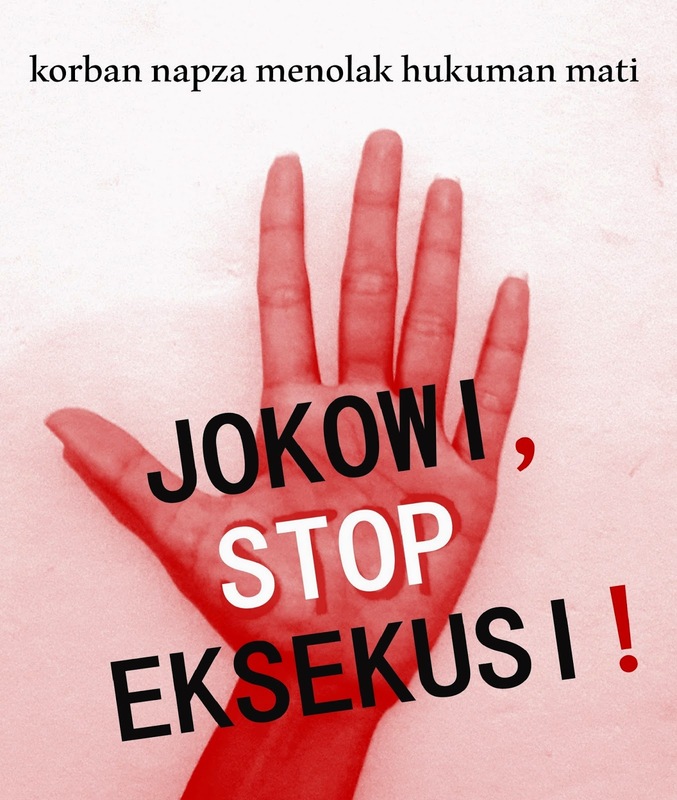 Based on the above description, we urge you Joko Widodo to immediately stop the execution of the death row narcotics, revisiting seriously and sincerely each case on death row narcotics, and evaluate the Indonesian narcotics law enforcement policy in order to truly can tackle illicit trafficking and assist recovery dependence addicts / users of narcotics. Thus we submit this Open Letter. For your attention, we thank you. in their journey to adulthood. We need to be strong, nurturing, and an influence for good in their lives. Please, President they are needing you as their leader to stand up for what is right to be their leader of positive influence and be someone they can be proud of .